[Testar] Lucre Lab - Parecido com paidverts! 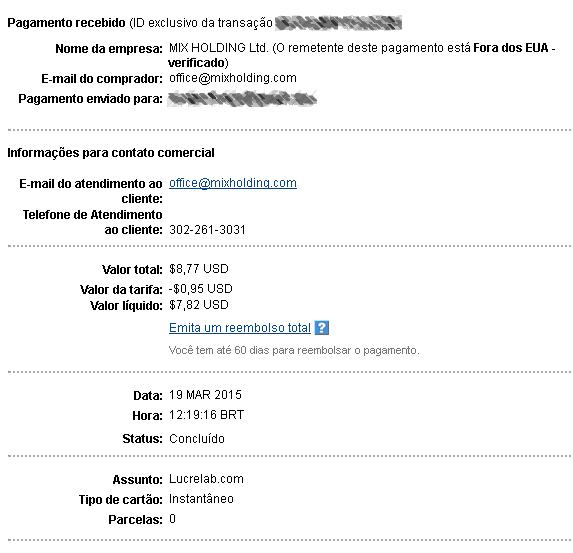 Re: [Testar] Lucre Lab - Parecido com paidverts! wesleylex esses imacros funcionam mesmo?? smvl1976 escreveu: qual o cashout minimo? "The value of the payment is only $ 0.5 for each payment processor, except STP and Payza. Minimum value of payment to those two payment systems is $ 1." Para que serve as lucrecoins? "LucreCoin is our own currency. You can buy this in our own marketplace. There are two types of fee when you sell LucreCoins. First fee is 3% when you sell LucreCoins directly to other user. Second commission is 2.5% and it will charged if someone will buy your offer with LucreCoins. This currency allows you to receive a weekly dividend. The amount of dividends depends on the project profits each week. It means, if our system generates much money, higher percent of all revenues is getting to currency holders. We are earning money from each fees in program and of course from our casino system. Money from exclusion captcha option and from our own auction system are summed to dividend too. There are 10 million shares of LucreCoins in circulation." COmo e que se ganha cash? DiZouk escreveu: COmo e que se ganha cash? Sender Name: MIX Holding Ltd. Message: LucreLab withdraw - Enjoy, Kamil! Tens muitos pontos no lucrelab?